From intensely haunted asylums and hospitals, to giant teapots, and mysterious holes and flying creatures, West Virginia has some very interesting spots to tickle your curiosity. Check out the links for additional information on each of the 15 unusual attractions listed below because some are only open at certain times of the year and others make recommendations as you plan your visit. 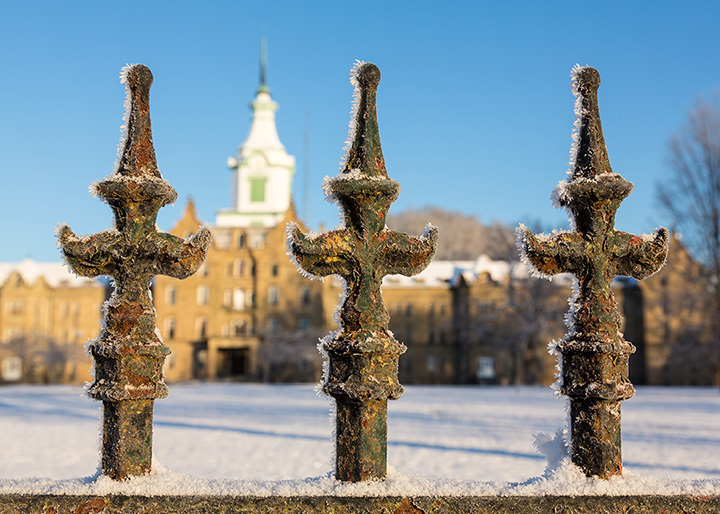 Opened in 1864 and used as a psychiatric hospital, the building and surrounding grounds were renamed Weston State Hospital until the time of closing in 1994. Over the years, the asylum was used for the criminally insane, alcoholics, and other mentally ill residents. It was closed and subsequently sold to a private bidder who had it placed on the National Historic Registry and worked to revitalize parts of the facility for public tours and other activities. Once a thriving coal town with one main way in and out of town, Thurmond boasted a bustling population. It is now a ghost town with only five people living there, according to the 2010 census. The movie “Matewan” was filmed here because of the historic and original Appalachian look and feel. If you want to see old-time West Virginia, this is the place to visit. Built to replace public prisons lost when West Virginia became a state during the Civil War, this Gothic stone structure operated as a prison for over 220 years. It housed several well-known prisoners, including spies and some on the FBIs Most Wanted List. The prison was also the site of several prison breaks and riots, the most recent being in 1986. It was decommissioned and opened as for public tours in the 1990s. You've heard stories of mad scientists and weird science experiments? Well, you'll be seeing realty if you travel to Philippi, West Virginia, to see the mummies at the Barbour County Historical Museum. In the late 1880s, a scientist who had been experimenting with different creatures to find a new way to embalm remains, successfully used two female cadavers taken from the Trans-Allegheny Lunatic Asylum. You can see the remains there for a dollar each. Arthurdale was the first federally-planned community under Theodore Roosevelt's New Deal in 1933. Originally built for unemployed white coal miners and their families, Arthurdale excluded unmarried individuals and immigrants. Eleanor Roosevelt took a special interest in the development of the community, but it was eventually deemed a failure because of lost federal funding. The town is now open as an historic district and worth the visit to see how people of that time lived. Originally a large barrel-shaped container used for advertising Hires root beer, the world's largest teapot was created when it was moved to the town of Chester, West Virginia, in 1938 to represent the pottery industry. In recent years, the teapot has received community and state support as an historic structure and campaigns to restore it have been undertaken. Definitely a must-see if you're in this area of West Virginia. Comprised of five boreal bogs and located high in the Allegheny Mountains of Hillsboro, West Virginia, Cranberry Glades Botanical Gardens is a Natural National Landmark. Named for the Cranberry River, from which it received its water, the bogs host numerous species of flora and fauna not found anywhere else in North America. Visitors can walk along a half-mile boardwalk through the bog and not disturb the environment. Known as a gravity-defying wonder, the Mystery Hole in Ansted, West Virginia, is open between May and October. Visitors will have their minds boggled with the things they see while there, but will leave with more questions than when they came. Created as a fallout shelter for Congress in the 1960s, the 150-room underground facility remained a secret until 1992. Once known, the bunker was decommissioned and now is open for public tours under the beautiful Greenbrier Resort in White Sulphur Springs, West Virginia. Opened in the late 1880s, the Phillips-Sprague mine, now known as the Beckley Exhibition Coal Mine, operated until the city of Beckley bought the mine in 1953. The coal mine went through extensive renovations and was opened to the public about 10 years later to showcase the history of coal mining in West Virginia. Visitors descend underground on vintage tracks with former miners as guides that explain the process of mining. Once above ground, there's a chance to visit the area that includes a Youth Museum. This is a great opportunity to experience a part of Appalachian history, but make sure to bring a sweater or jacket since the underground temperature is a cool 58 degrees. People for thousands of years have recognized the health benefits of hot springs, especially those with inherent components such as Sulphur, which is in abundance in the White Sulphur Springs area of West Virginia. According to George Washington's firsthand account, he visited the hot springs located in Berkley Springs, Virginia, in 1748 prior to West Virginia being formed as a separate state. Washington was known to have numerous physical conditions that could have been lessened by visiting the hot springs frequently. The existing spring today is a replica of what the bathing pool would have looked like at the time of Washington's visit. Is it a bird? Is it a plane? It could be the legendary Mothman of Point Pleasant, West Virginia. Visitors to this popular area of the state across the Ohio River from Gallipolis, Ohio will be able to visit the Mothman Statue and tour the Mothman Museum to see original sketches and newspaper clippings about possible sightings of the strange supernatural creature that many believe foretold the collapse of the Silver Bridge in 1967 and the death of 46 people. Once a burial ground for a local tribe, the Clay family built a homestead on this site in 1783. Because of the disagreement of ownership and during an Indian raid, three of their children were killed. Mitchel Clay killed several natives in retaliation. Lake Shawnee Amusement Park was built on the property in the 1920s and remained open until numerous deaths of children under unusual circumstances occurred. The property has been featured on the Travel Channel's "The Most Terrifying Places in America", and is open just during the month of October, when visitors can take their changes to see the ghosts that live there. Always proud of the role coal has played in West Virginia history, residents of the small town of Williamson, West Virginia, decided to build a house made entirely of coal to honor its heritage. This coal house was the first of two that exist in the state. The other coal house is located in Lewisburg, West Virginia. Yes, it's true. If you've ever wondered what squirrel, raccoon, opossum or bear tastes like, you have a chance to find out if you attend the annual West Virginia Roadkill Cook-Off in Marlinton, West Virginia. Unique dishes are prepared by amateur chefs include previous winners as black bear chili, quail meatballs, and snapping turtle stew.